Infused with over one hundred and fifty different oils, herbs, and botanical flavors, Acid Remi Blue are hand-rolled premium cigars produced individually by expert Torcedos at the Drew Estate Factory in Nicaragua. 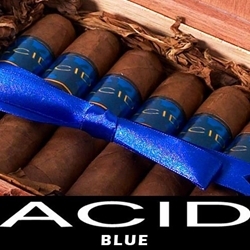 Each Acid Remi Blue cigar is expertly cured and bundled up in a fresh US Connecticut Broadleaf with the exception of the Kuba Kuba brands that are wrapped in a Sumatra tobacco leaf and the Remi Blue Deep Dish that uses the Cameroon. If you love an excellent hand-crafted premium cigar, pick up an Acid Remi Blue today and find out how great they really are.